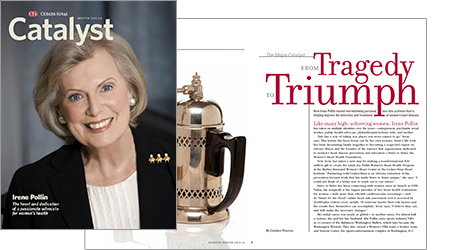 Catalyst, a donor-focused magazine at Cedars-Sinai Medical Center, spotlights the important contributions of its philanthropic partners. Like many high-achieving women, Irene Pollin has taken on multiple identities over the years—entrepreneur, psychiatric social worker, public health advocate, philanthropist/activist, wife, mother. "Life has a way of taking you places you never expect to go," she says. For Pollin, the key to that journey is setting positive goals. She's seen it transform her own life and the lives of countless others. It's the principle behind Sister to Sister, the Women's Heart Health Foundation, which Pollin founded in 1999 as the nation's first organization dedicated to women's heart disease prevention and education. Today, Sister to Sister is the largest provider of free heart health evaluations for women—with more than 100,000 cardiovascular screenings so far—and its "Smart for the Heart" online heart risk assessment tool reaches more than 20,000 women globally every month. Pollin has witnessed the power of that knowledge. "If someone knows their risk factors and the results they themselves can accomplish," she says, "I believe they can, and will, make the necessary changes." Her initial career was in a different arena—literally. For nearly a half a century, Pollin and her husband, Abe Pollin, were sports VIPs, as co-owners of the Baltimore/Washington Bullets National Basketball Association (NBA) team, later the Washington Wizards. They also owned the Washington Mystics Women's NBA team, the Washington Capitals hockey team, and the sports-entertainment complex, Verizon Center, in Washington, D.C. The couple met at age 17. "We essentially grew up together," recalls Pollin. Together, the Pollins were partners in business, parenting, and a commitment to social responsibility until Abe's passing in 2009.